Any discerning gentleman knows the importance of an impeccable shirt. Whether you wear one everyday for work, or only turn to it when a formal occasion calls, it is an essential item which no man’s wardrobe should be without. However, a good shirt can be hard to come by. It doesn’t matter if you’re splashing out £50 or £350, the mass produced shirts of high street brands and top designers alike mean that fits flawless to the individual are nigh on impossible.
. With myriad fabrics, linings, collars and cuff styles to choose from, you can have a shirt made to cater exactly to your particular needs. Want your sleeves just half an inch shorter or a specific colour? Not a problem. You don’t need to be a Saville Row regular to order bespoke. 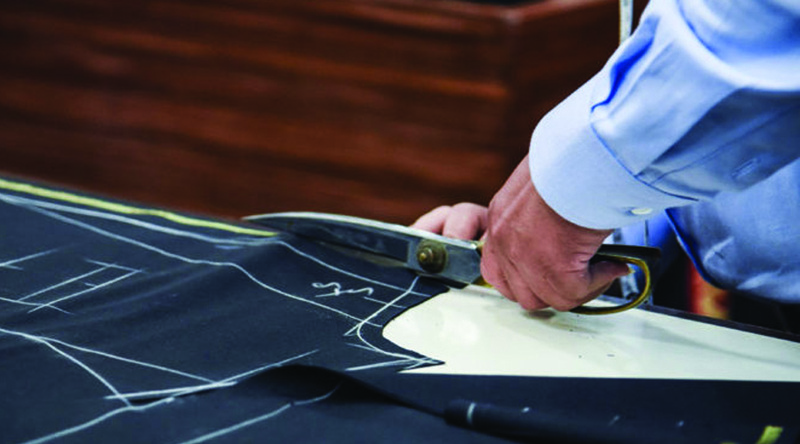 Even if you consider yourself a tailoring amateur, a team of experts will be on hand to offer their knowledge and advice to ensure that your shirt is perfect right down to the very last stitch. Invest now and save yourself countless hours of futile online browsing or exasperating fitting room visits trying to figure out what works best for you – the shirtmakers are there to help. When cared for correctly, a personally tailored shirt can last for years rather than a few pitiful months, as is often the case with ready-made items. Opt for bespoke to save yourself from buying endless future replacements – your bank account will thank you in the long run. Since we’re on the subject of money, remember that going bespoke isn’t as expensive as you may think. Instead of emptying your pockets for an off-the peg shirt – simply because it’s by a swanky designer – acquire a bespoke shirt that will both fit better and could even come in at around a similar price point. A quality shirt lays a good foundation for the rest of your outfit, so say goodbye to tailoring faux pas such as awkwardly bunched sleeves or uncomfortable and unsightly pulling across the belt line. The ultimate compliment to the rest of your outfit, a bespoke shirt will give you a much sleeker, sharper silhouette by building your look from inside out. Amongst all the trends and fashion fads that society is expected to follow it can be difficult to stand out, remain unique, and perpetuate an individual image these days. What would be more special, then, than pulling on a shirt in the morning safe in the knowledge that it’s truly one of a kind?